Biological treatment using low-load activated sludge is utilised in most cases to remove as much biodegradable COD as possible. COD removal efficiency is typically 70 to 90% when the raw wastewater’s COD/BOD ratio is between 2 and 4, which is often inadequate and requires additional tertiary treatment. 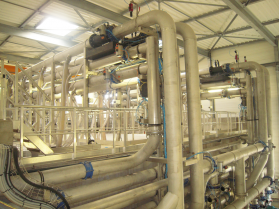 When the raw wastewater COD concentration is sufficiently high (approximately ≤ 2 g · L–1), the Ultrafor membrane bio-reactor represents an ideal solution.